Thanks to colorful folklore passed down through the generations, we know that the whiskies made in Ireland today little resemble their 19th century predecessors. 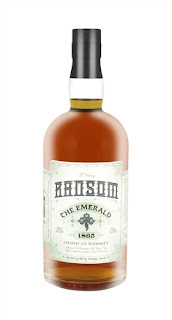 Trouble was, there was none of the traditional whiskey left to taste in our quest to recreate the long lost gems of the Emerald Isle. Fortune gave us two good turns; a British excise agent who recorded an Irish mash bill in 1865, and our friend David Wondrich, who found said recipe poring over the microfiche annals of history and passed it along to us. With this mash bill as our guide, we set out to create our own interpretation of a traditional whiskey of Ireland. To call our version modern might be a stretch— We grow a percentage of the barley organically on our farm, our grains are milled, mashed and fermented in small batches at our distillery and farm in the emerald hills of Sheridan, Oregon, and we distill according to our senses in our handmade, direct-­‐fired alembic pot still. The Emerald matures in a mix of French and American oak for three years, and is hand bottled, capsuled, and labeled. The result is a highly aromatic spirit with the weight, richness, and complexity of its forebears.